High efficient exhaust fans with stylish design for new enhanced comfort in bathrooms. Maximum air capacity - 187 m³/h. Sileo 150 is equipped with a double-speed motor and Sileo Max 150 is equipped with a double-speed highpower motor.The new automation in the models Sileo 150 and Sileo Max 150 enables to set one of five fan operation modes. Changeover to another operation mode is easily performed by setting the DIP switch to a respective position. Specially designed mixed-flow impeller profile ensures high air flow and low noise level. Casing and impeller made of quality durable UV-resistant plastic. Backdraft damper for back flow prevention. 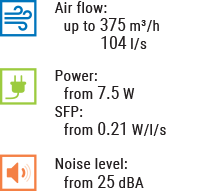 The high ingress protection rating of IP45 makes the fan the ideal solution for the ventilation of bathrooms and shower rooms. Low energy demand from 75 W due to a new high-efficient motor. The motor is mounted on special anti-vibration dampers. The exhaust pipe incorporates a specially designed air rectifier to reduce the air turbulence, increase pressure and lower the noise level. Turn-off delay timer adjustable from 2 to 30 min. Turn-on delay timer adjustable from 0 up to 2 min*. Detection range from 1 up to 4 m.
Turn-off delay adjustable from 2 up to 30 min. Turn-on delay adjustable from 0 up to 2 min*. Detection angle up to 100°.